This is kind of an unusual review, I have to admit. 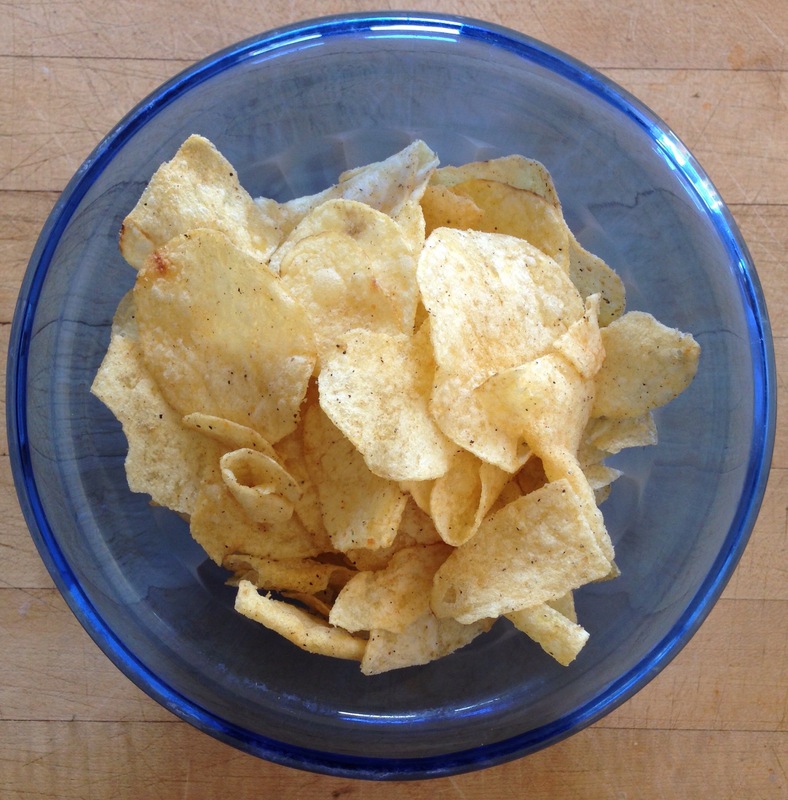 Lay’s has this flavor contest. I think they did it last year but I don’t recall the flavors. 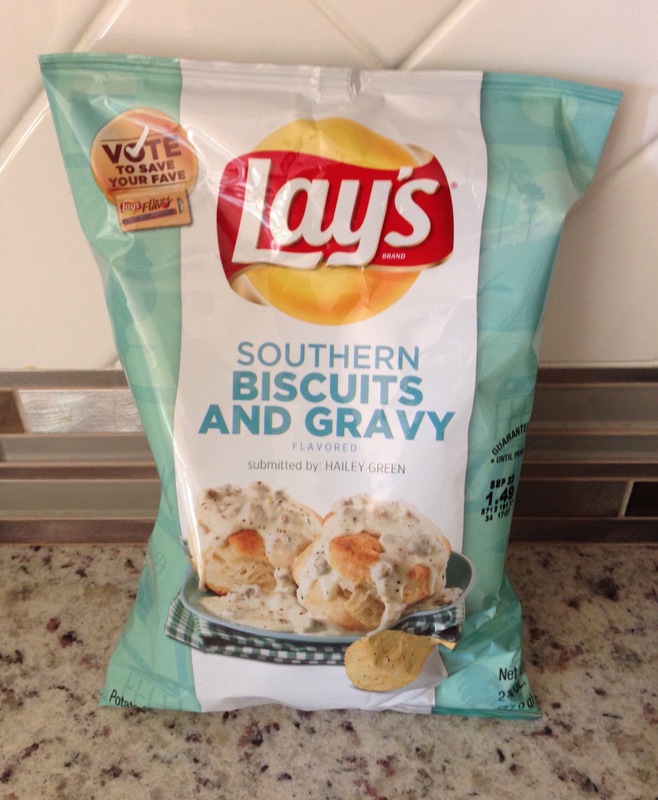 Imagine my surprise this year when I saw that they have a Biscuits and Gravy flavor! You know you want to try them. This morning we were looking for something “light” for breakfast. Ordinarily I would not consider potato chips, but these have “biscuit” in the name so I made an exception. 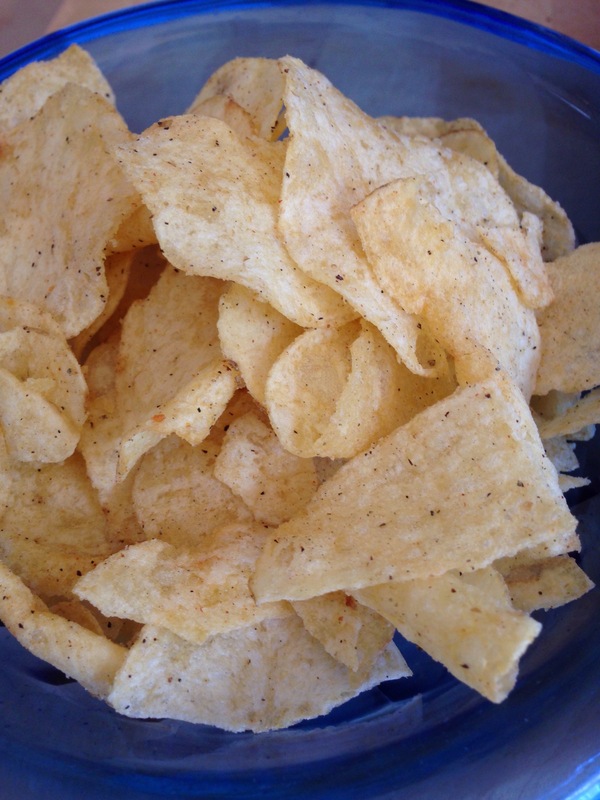 They looked, as one might expect, like potato chips, with flavor dusted lightly over them and what appears to be a bit of pepper. They tasted, if not exactly like biscuits and/or gravy, really good! If I didn’t know what they were going for, I don’t think I would have guessed. Regardless, there was a bit of buttermilk tang to it, pepper, and some other spice that did remind me of sausage. Overall, I think they did a really good job with this flavor combo. There are three others: Reuben, Gyro, and Truffle. You can vote on your favorite, starting tomorrow. I doubt I’ll try the other flavors, but I just might vote. 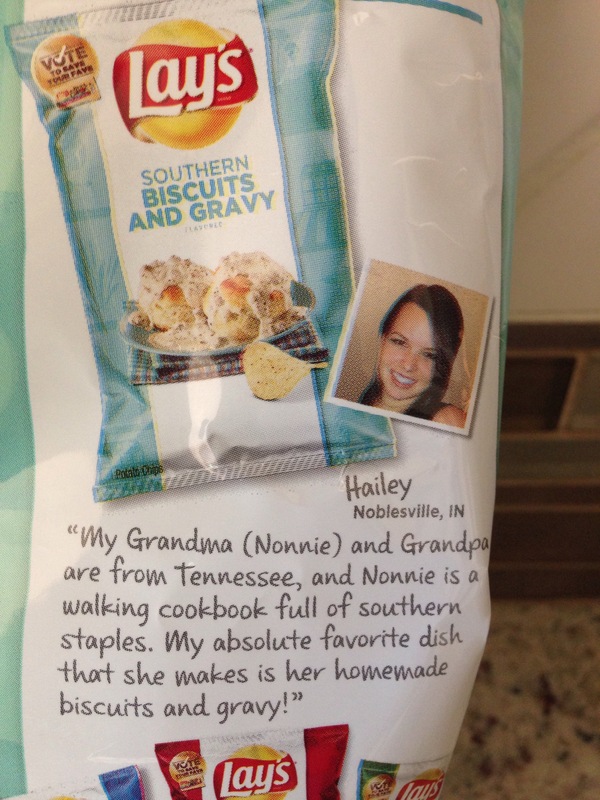 The story from the submission is kind of cute, the chips were good, and, well, biscuits! This is what They said. But did we listen to Them? No. The demands of engagement, moving, and wedding plans sadly derailed much of our adventurous eating out. Months passed. Then my hip Atlanta cousins came through town for a family wedding. “Have you been to Husk?” They asked. Chastened, we answered that we had not but that we must go for brunch that very weekend. Hip cousins wisely made reservations. We did not and did not stand much chance of getting a table. So we followed our old dating routine and went straight to the bar, which, although tucked away in a corner of the lower level, was bright and cheerful and, for the moment empty. Hip cousins hung with us for a Bloody Mary and a fun visit until their table was ready. Then we had to focus on the menu. It did not take long to decide, once we caved and agreed to order all of the things we really wanted. To start, we went with the biscuits and gravy. I don’t know what I expected, but I can tell you that my expectations were far surpassed. Photos will never do this dish justice. Words cannot adequately describe. This was the most basic of comfort foods accompanied by sophistication and complexity of flavor and texture. The biscuits were perfect. Fist sized with a slightly salty crust on the outside. Moist and somewhat peppery on the inside. Melt in your mouth. Glorious. Still, it was the gravy that took this dish over the top. I don’t know what kind of sausage they use, but it has an incredibly rich and deep flavor that infused all of the gravy. The rest of the meal was wonderful, too. M got the Benedict and I had the french toast that seemed to contain everything except the kitchen sink: maple syrup, peaches, blueberries, and whipped cream; bread filled with peanut butter. Somehow, all of these ingredients were balanced so well that they worked together perfectly. Best french toast ever. M. and I have begun what we are calling the Farewell Tour of East Nashville. I’m only moving across the city, but I know we won’t make it back to this part of town as much. So we are revisiting the places we have loved in our two and a half years of dating. I’ve missed you, I thought as we drove into the parking lot of the Nashville Biscuit House. 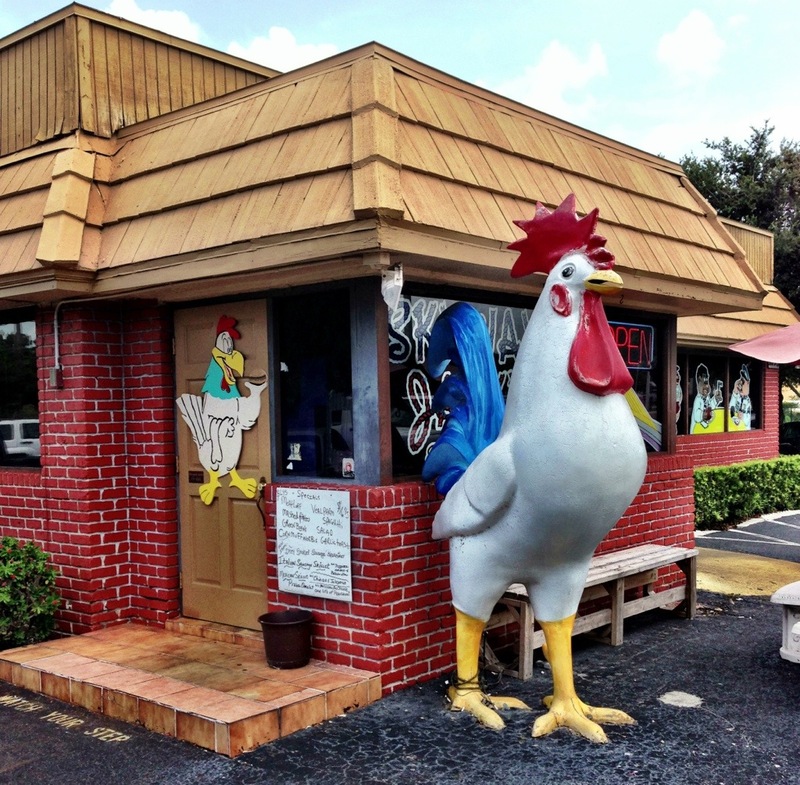 It is a comfortable place, diner-ish, familiar like an old friend. It was rainy and a little cold out so some comfort food was in order. We waited a few minutes for a table, standing just inside the door, watching the bustle of the place. There is no discernible pause. Someone is always sitting down, getting food, refilling coffee, lining up at the register to pay. The waitresses all wear these t-shirts, which are also for sale. Every time we go I have this internal dialogue. “I would LOVE a Nashville Biscuit House t-shirt. But the shirts have muffins on them, not biscuits. You don’t want a muffin shirt. Who designed these things anyway? Don’t they know the difference between a biscuit and a muffin?” I have not bought one yet, but am still torn. This tin was on a shelf. Probably not the same kind of biscuit, but pretty cool anyway! The menu consists of all of your standard breakfast foods – bacon, sausage, eggs, pancakes, etc. – combined in different ways and amounts so that everyone gets just what they want. 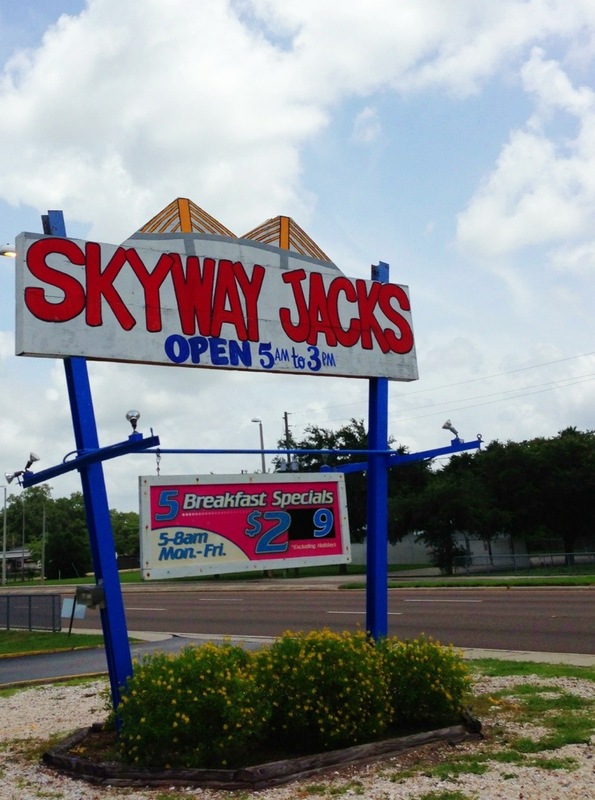 Prices are very reasonable, the food is hot and fresh, the waitresses are friendly, and the coffee is passable. I’ve eaten – and watched the eating of – a wide variety of breakfast configurations and no one leaves this place hungry. Regardless of what else I order, I always get a biscuit, and have even been known to order an extra one after my meal is finished. Just ’cause. On this day, I kept it simple. I ordered a biscuit sandwich with egg and turkey sausage. All the breakfast goodness I could want on a fresh-from-the-oven buttermilk biscuit. I persuaded M. to get a side of gravy that we could share. In the process of ordering that we learned the difference between their Country Gravy, which is a plain white vegetarian sauce, and their Sausage Gravy, which is just their Country Gravy with sausage crumbled into it. That explains it, I think. I have wondered why I prefer some sausage gravies to others. I’ve not tried making it myself (yet! ), but think I like when the sausage is more incorporated – using the sausage drippings in the gravy as it is being made. That’s something I will have to try myself. Nonetheless, the biscuit sandwich was delicious. I like to play with my food, so I ate some “as is,” some with jelly, and saved some biscuit to eat with the gravy. The biscuits here are so fluffy and tasty that I could eat them plain, but where’s the fun in that? As we left, we saw that the line to get in was out the door, literally, and some people were even waiting in the rain. I felt a little guilty about lingering over my coffee. But I knew that soon enough these folks would be ushered into the warmth and served a good hot breakfast. They would just be glad to be there because sometimes good things are worth waiting for, you know? 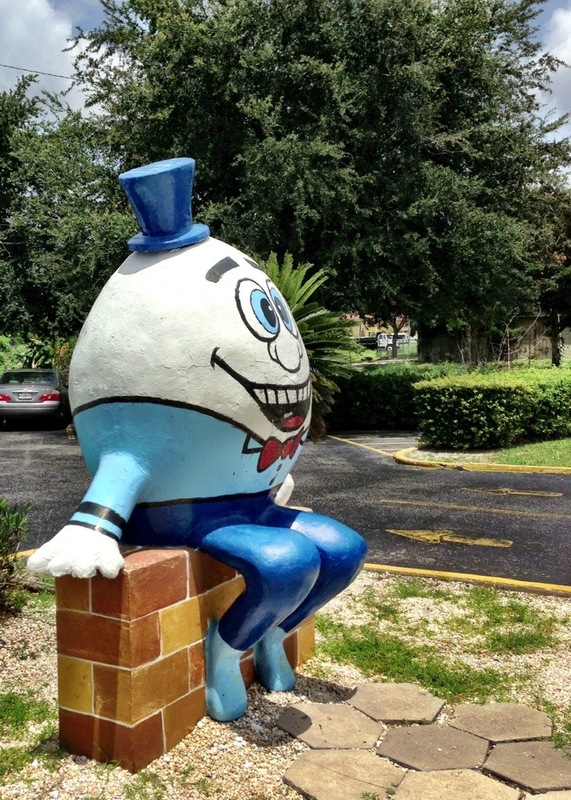 How can you not go to a place that has not only a giant chicken outside, but also a humongous Humpty Dumpty sitting on the wall? There were many tasty and creative items on the menu, but I selected a traditional scrambled egg and sausage meal with a biscuit and a side of sausage gravy. The biscuit was huge and appeared to be homemade. On its own, it was a bit heavy. But it proved to be an acceptable conduit for the gravy. 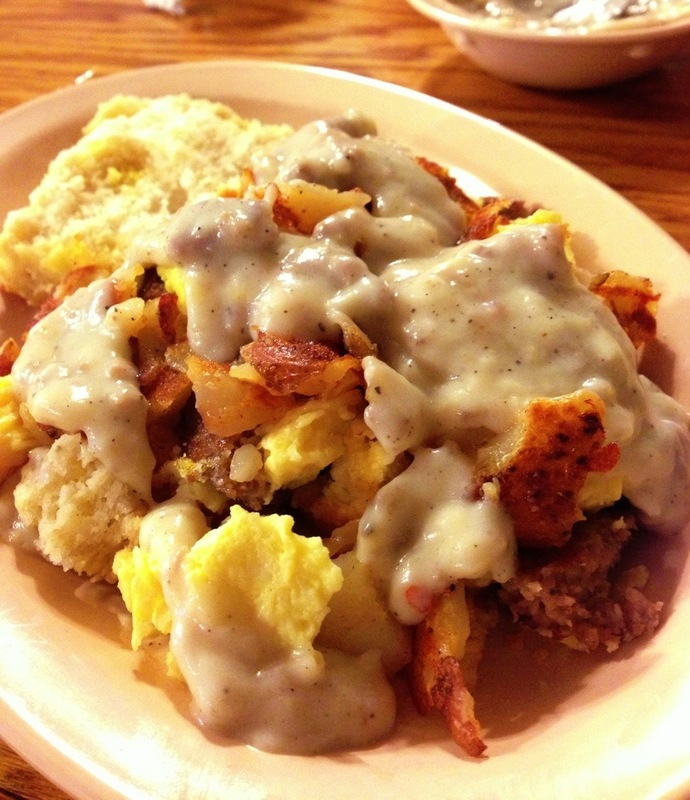 I ended up creating my own sort of breakfast bowl with sausage, eggs, potatoes, and biscuits jumbled together and all smothered by the peppery sausage gravy. My companion called it a Breakfast Jump-up (movie reference). I called it scrumptious. They really should add this to the menu, don’t you think? 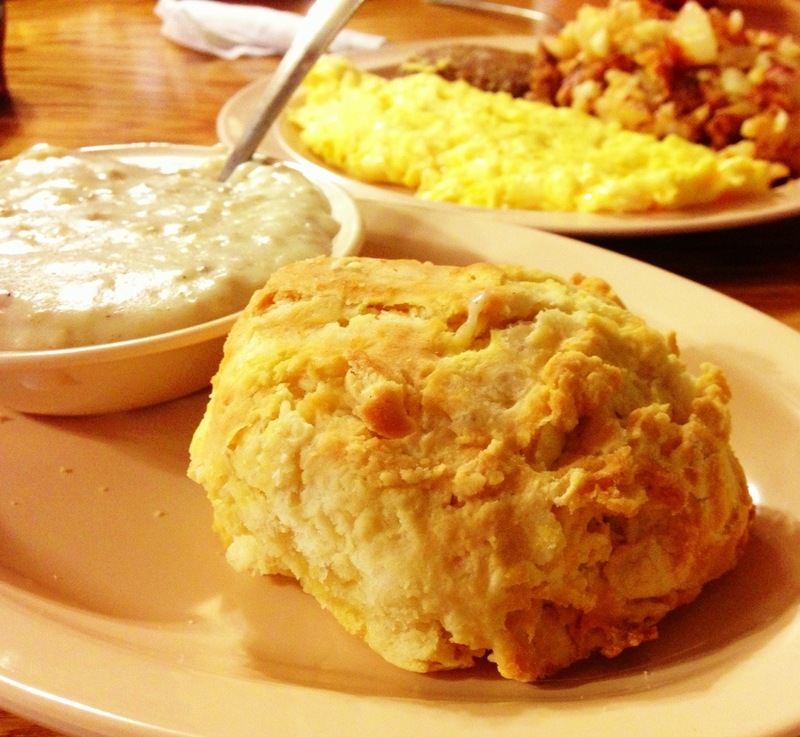 They could call it The Persnickety Biscuit Special.